Until Street Fighter X Tekken arrives on the Vita the fighting market is pretty open. Sure you could go for BlazBlue, but some may prefer something a little different and a new IP to go with their new handheld. 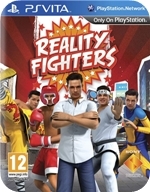 Reality Fighters comes loaded with gimmicks, but does it pack enough punch to warrant a place in your collection? This arcade fighter’s hook is letting you put your own face onto the fighters. A further use of reality takes advantage of the Vita’s rear camera to fight against a real-world background, in real-time or from pictures you snapped earlier or from a few glossy pre-loaded ones. Less than a month to go now before the PS Vita arrives and we can’t wait. There’s a fantastic number of titles available around the launch and we’ve been everywhere from LA and E3, Germany and Gamescom, and more recently London and Manchester to try them out. So take a few minutes to look through our guide to see what you fancy picking up.